It's the fourth time that Manny "Pacman" Pacquiao and Juan Manuel Marquez will be facing each other and it would probably be the match that could settle disputes between the two camps. Below is the official press release of the featured match between Pacquiao and Marquez on December 9, 2012, live via satellite, in SM Cinemas. The 4th Pacquiao-Marquez fight is, without a doubt, one of the biggest bouts of the year. In a sport where everything is unpredictable, where one punch can change everything, no one is sure to know of who has the upper hand in the 4th, and probably the decisive fight between Manny Pacquiao and the Mexican dynamo Juan Manuel Marquez. Both men are considered among the greatest fighters in the history of boxing with Manny “Pacman” Pacquiao being the first eight-division world champion and the first to win the Lineal Championship in four different weight classes, making him a boxer of Muhammad Ali’s caliber. Juan Manuel Marquez III, on the other hand, is the greatest Mexican boxers of all-time for many analysts. He is the current WBO light-welterweight champion and the third Mexican-born boxer to become a four-division world champion, winning seven world titles in four different boxing weight classes. The first fight between Manny Pacquiao and Juan Manuel Marquez, who at that time held both the WBA and IBF Featherweight titles, happened way back in 2004 at the MGM Grand Arena, Las Vegas. Pacquiao knocked Márquez down three times in the first round, but the battle went the distance, the pair couldn't be separated by the judges and the fight ended in a draw after 12 rounds. The decision sparked controversy, which outraged both camps. On March 15, 2008, a rematch called “Unfinished Business” was held at the Mandalay Bay Resort and Casino in Las Vegas. Pacquiao won via split decision which earned him the WBC Super Featherweight and The Ring Super Featherweight titles, making him the first Filipino and Asian to become a four-division world champion, a fighter who won world titles in four different weight divisions. “It was a very hard-fought fight and much more exciting than the first one," Marquez said. Like the previous match, the decision of the judges spurred a 3rd bout which was held on November 12, 2011 at the MGM Grand in Las Vegas, Nevada. Pacquiao won the fight via majority decision. Pacquiao’s victory was also controversial one. Now it's time to shed doubt over who the best fighter is as both boxers are aiming for knockout. On December 9, the 4th fight will be held in Las Vegas, Nevada. Be one of the first to watch a fight that would most probably bring a closure to one of the greatest boxing rivalries in history! 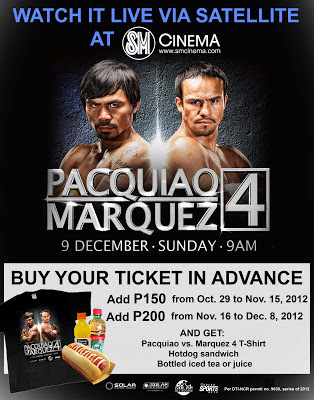 Catch the 4th Pacquiao-Marquez fight live via satellite in any SM Cinema branch at 9:00am on December 9, 2012. 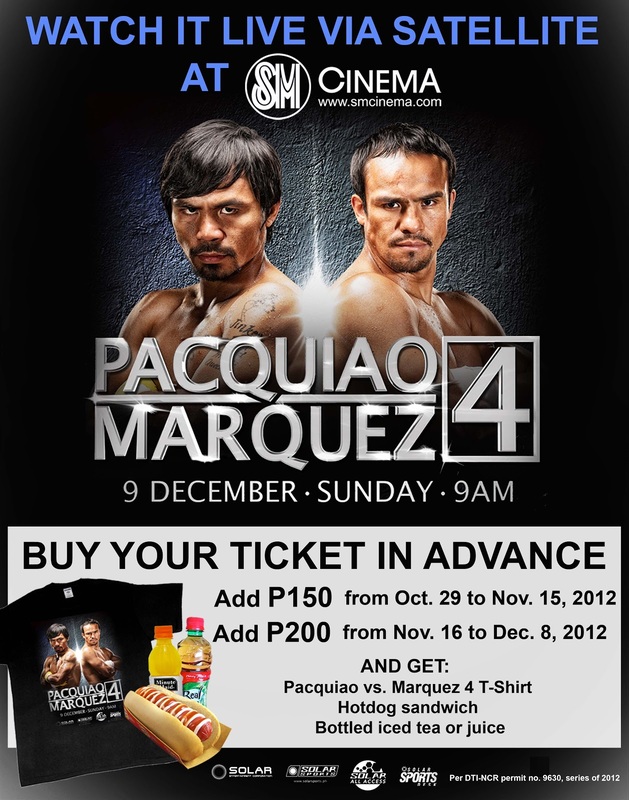 Buy your ticket now and just add Php200 to get a hotdog sandwich, bottled water or juice and a limited edition Pacquiao-Marquez 4 Shirt. To know more SM Cinema, visit their website at www.smcinema.com. You may also like SM Cinema on Facebook (facebook.com/smcinema) and follow them on Twitter (twitter.com/sm_cinema). To connect with IMAX on Facebook, follow facebook.com/imaxsmcinema and like them on Twitter.com/imax_smcinema.